If the name Mike Salek sounds familiar to you, you’ve probably been with us for the long haul. 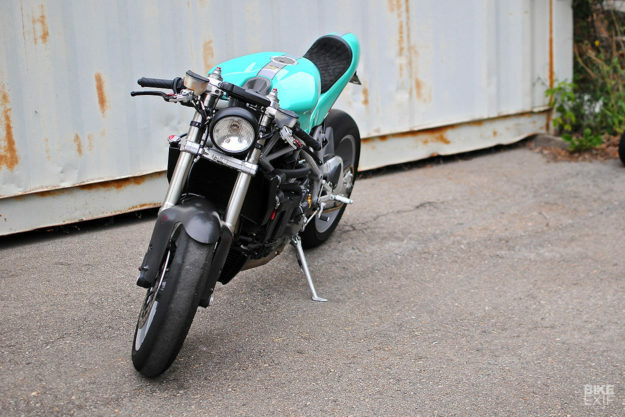 Because seven years ago, when retro Honda CB café racers were all the rage, Mike built an incredible example of the type that melted our servers. Then all went quiet. A few days ago, Mike got back in touch. “It was about time I built something else, after my CB made such a splash,” he tells us. 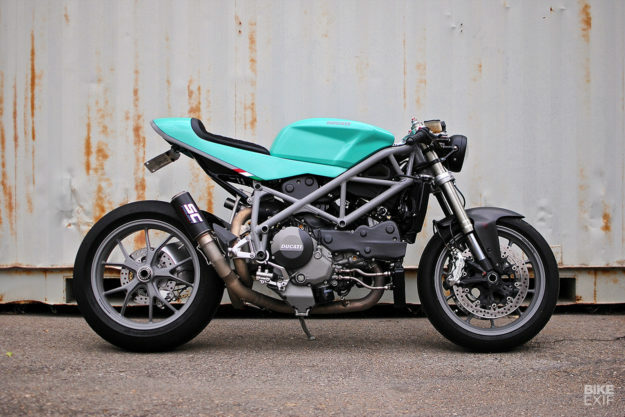 And so we have this very sporty Ducati 848 cafe fighter, built in two countries. Mike runs a company that makes pumps for the oil and gas industries. He regularly makes the 1,500-mile trip between Calgary in Canada and Palm Springs in the USA—but he doesn’t let the travel get in the way of bike building. “It seemed logical to fly it back and forth, since there are so many amazing resources in Southern California,” he explains. 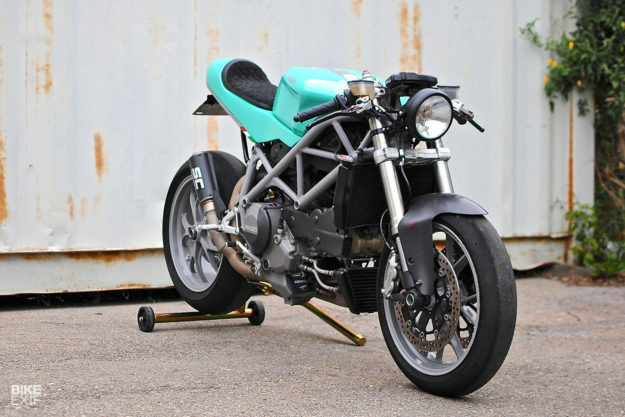 He started out with a lightly used 2008 Ducati 848: a 168 kilo (370 lb) pocket rocket that delivers a mighty 116 rwhp when it leaves the factory. But Mike has been riding and racing bikes for nearly three decades now, so he went in search of even more power. The desmodromic L-twin is now hooked up to a Power Commander, which takes advantage of the modified airbox and K&N filter. 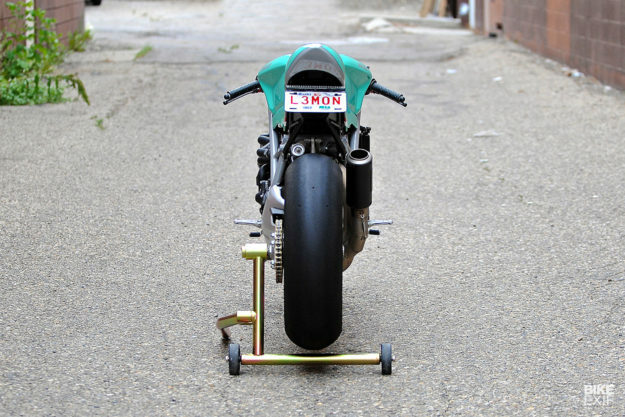 There’s also a custom exhaust with a stubby muffler from MotoGP suppliers SC Project. We’re guessing the sound levels are pretty high. One essential part that didn’t exist at the time was the tail section. 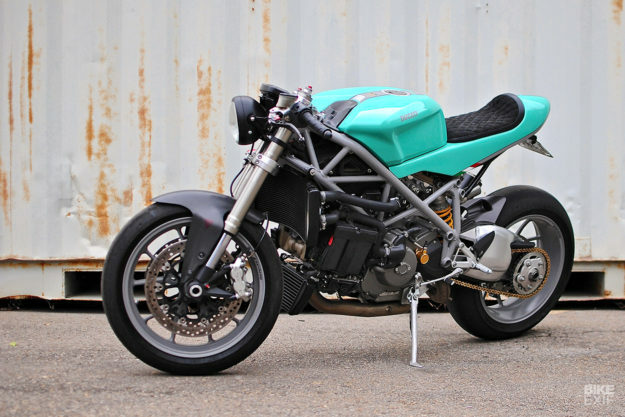 There are quite a few customized Ducatis floating around these days with off-the-shelf fiberglass units, but those don’t appeal to Mike. Mike knew exactly the man for the job: the gifted coachbuilder David Martinez of Martinez Industries. 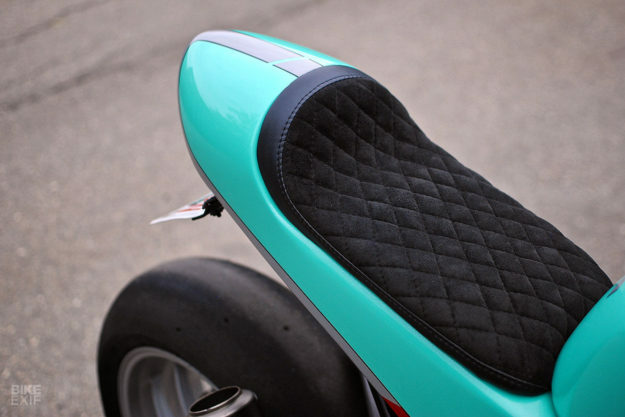 Together, they sketched out an elongated design that runs underneath the seat. The frame and wheels went to Next Level powder coating in Yucca Valley, where they were baked in a light satin gray to complement the delicious paint. Then Mike packed it all up again, and put the bike back onto the plane, ready for countless hours of careful assembly in Calgary. 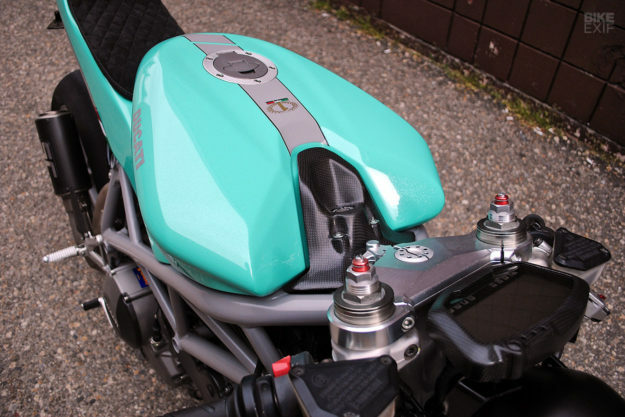 He’s added custom carbon fiber panels to enclose the underside of the trellis subframe, and sprinkled the rest of the 848 with matt carbon fiber trim parts. 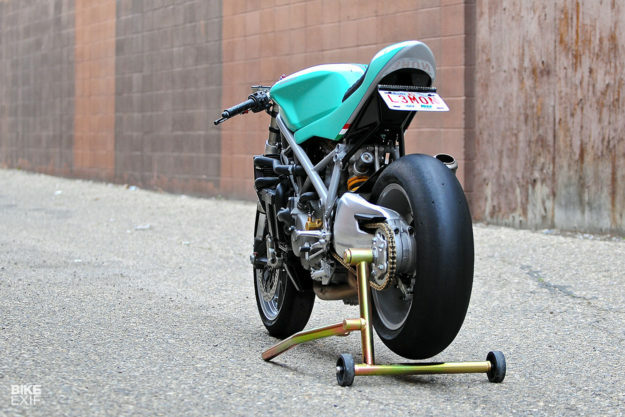 The 848 now rides on a set of sticky Pirelli Diablo Superbike slicks, with control upgrades to match. 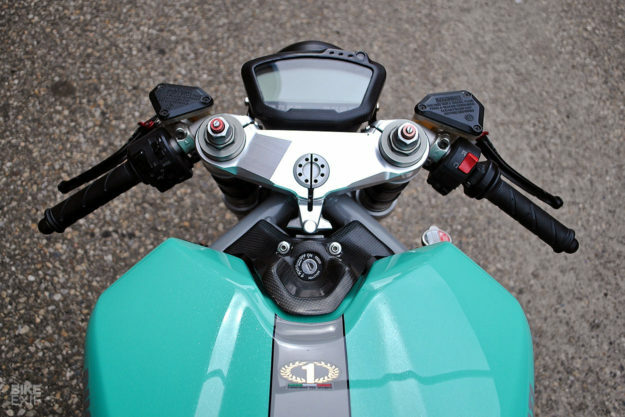 Thanks to Ryan Taylor of Taylor Racing in Calgary, the bars and fluid reservoirs are from a Ducati 999. “They sit even with the upper triple, while the stock ones sat a few inches above the triple,” Mike explains. 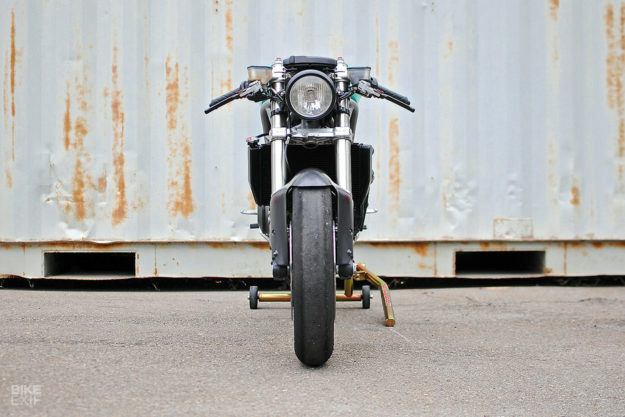 Eagle eyes will also note the simple 6″ headlight clamped by LSL headlight mounts, CRG levers, and custom speedo mount with a carbon fiber cover. The wiring harness has been stripped down, shortened, rewrapped and tucked away. 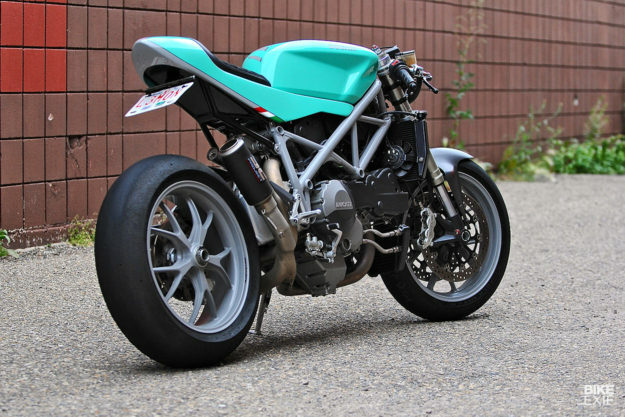 We reckon Mike’s Ducati looks even better than the 848 Streetfighter that Bologna released in 2011. It’s simple, clean and focused—the perfect example of the modern ‘cafe fighter’ genre?